Close Puppy Mills - Did you know? Two AKC JUDGES were charged with 22 counts of ANIMAL CRUELTY against their own dogs in THEIR puppy mill!! Unbelievable? Sometimes what we have been led to believe all of our lives about certain people or organizations ... simply is NOT true. But now ... you know the TRUTH! Miriam Winkler & James Deppen of 'The Judges Choice of Ironwood Kennels' in Pennsylvania were charged after an unannounced inspection of their kennels. They were ordered to seek immediate Vet care for their dogs (one was severly emaciated). SADLY, one of these dogs died before he could even receive medical attention. This again, from the SAME organization that professes to LOVE dogs ?!??? It's time to wake up everyone! See the article in the 'Morning Call' newspaper. ** Believe it or not, the AKC is the largest and most active organization opposed to any changes in the Animal Welfare Act that would improve conditions in puppy mills. That's right! The American Kennel Club (AKC) is the most effective opponent of positive animal legislation, more so than all other organizations combined according to Bob Baker, investigator for the ASPCA. It appears that this organization is truly 'a wolf in sheep's clothing'. Why would the AKC, who has deceivingly appeared for years to be concerned about the welfare of man's best friend, fight so very hard to prevent changes in the laws that would protect dogs? Could it be because there are approximately 2-4 million puppies born in puppy mills each year and the AKC gets revenue for each & every puppy registered with them? Please do NOT support the AKC ! ** The USDA is responsible for the oversight of all puppy mills (kennels) in this country. Yet there are countless kennels (puppy mills) with numerous cited violations that still continue to operate and keep helpless dogs in squalid torturous conditions. According to published reports, the USDA actually encourages farmers to operate puppy mills to supplement their income! They feel their mission is to help the farmers, not punish them, according to Bob Baker. The USDA even recently gave a huge business loan to the largest dog broker in this country, the HUNTE Corporation. Kathy Bauck of Minnesota (Pick of the Litter Kennels) was convicted by a jury, of animal cruelty. This kennel that has been operating for many years, was exposed after an undercover investigation. However, in 1998, Bob Baker ASPCA anti-cruelty investigator, reported the horrific conditions of Kathy's puppy mill to the USDA and nothing was ever done. The USDA did nothing to stop this woman. Where is the justice? In one past court appearence this "woman" got a 'slap on the wrist' for killing a PUPPY by slaming it up against a pole! We NEED to tell our elected officials we will no longer accept this complacency of animal abusers. The USDA has a long history of NOT enforcing the Animal Welfare Act & allowing puppy millers to go unpunished for repeat violations. The Office of the Inspector General conducted an investigation into violations in puppy mills from 2006-2008. This scathing report of how the USDA has NOT done their job of enforcing the law to protect these innocent suffering souls will shock & anger you!! ** After reading, PLEASE contact your senators, congressman & the USDA & express your anger that this has been allowed to go on for so long! ** These trapped & suffering dogs have no voice ... lets speak up for them. The USDA @ 202-720-3631. Respectfully state that we are tired of the USDA NOT enforcing the Animal Welfare Act & we want this abuse of these puppy mill dogs stopped immediately. PLEASE at least skim each page & see pictures! Pages 15, 16, 17, 22, 23, 25, 56, 57 & 58. We should ALL be outraged & demand that the USDA be held accountable for allowing this suffering to continue year after year !
" One person can make a difference and every person should try." After an eight month long investigation by the Humane Society of the United States, PETLAND pet stores and the Hunte Corporation are now the focus of a class action law suit brought by heartbroken pet parents whose dogs bought at PETLAND, have died or are suffering from innumerable health conditions. According to the results of the investigation by the HSUS, PETLAND Pet Stores have sold almost 17,000 puppies traced back to puppy mills!!! Petland LIES to unsuspecting customers about where their puppies come from. It's been proven time & again. Watch just one undercover video & see for yourself! 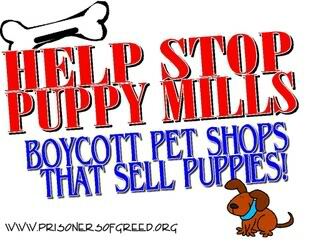 Please do not support puppy mills and NEVER buy a puppy from PETLAND or any other pet store. Another pet store with numerous lawsuits pending against them for selling sick puppy mill puppies is: The WIZARD of CLAWS Stores. They also sell over the internet! You can visit a local SHELTER in your area and request a particular breed of dog? YES, it's true. If you are only interested in one particular breed of dog, most shelters will welcome your application for that breed, if there are none in the shelter at the time of your visit. Most shelters will gladly hold your application until a dog of that specific breed arrives, since 1 out of every 4 dogs in shelters are pure breds. new family member from a shelter or rescue. **Also check out www.petfinder.com They have almost every breed of dog (ALL ages) available for adoption & they are all rescues. Great place to find your new best friend!